Retrofit flashings (also called a split flashing/or split boot) are used in applications where you cannot slide the flashing over / down a penetration. The retrofit flashing is split which allows you to wrap around the pipe penetration and seal. 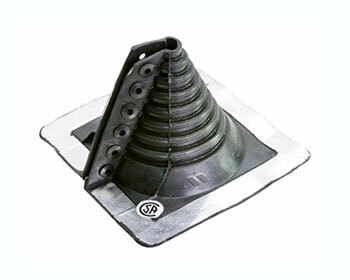 Base is 8-3/16" x 8-3/16"
RETROFIT SMALL SIZE, ROUND BLACK EPDM PIPE FLASHING BOOT. FITS 3/4 to 2-3/4 INCH ROUND PIPES. PRICE/EACH.